Researchers have found a new way to measure the pull of gravity at the surface of a star. For distant stars with planets orbiting them, this gravitational information is key in determining whether any of those planets can harbor life. The new method is described in a study published today in Science Advances. The research was led by University of Vienna’s Thomas Kallinger and involved UBC Professor Jaymie Matthews as well as astronomers from Germany, France and Australia. 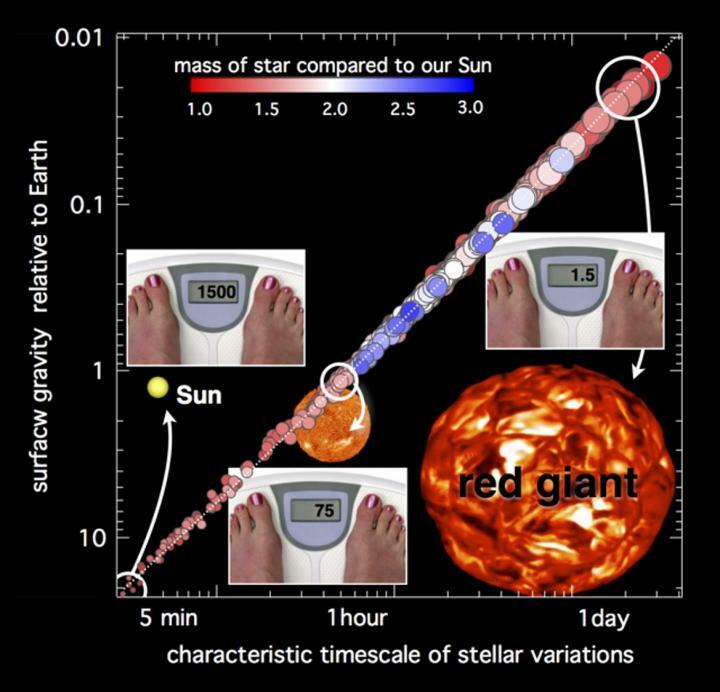 Knowing the surface gravity of a star is essentially knowing how much you would weigh on that star. If stars had solid surfaces on which you could stand, then your weight would change from star to star. The Sun is hotter than a sauna, but don’t expect to lose weight there. You’d weigh 20 times more than on Earth. 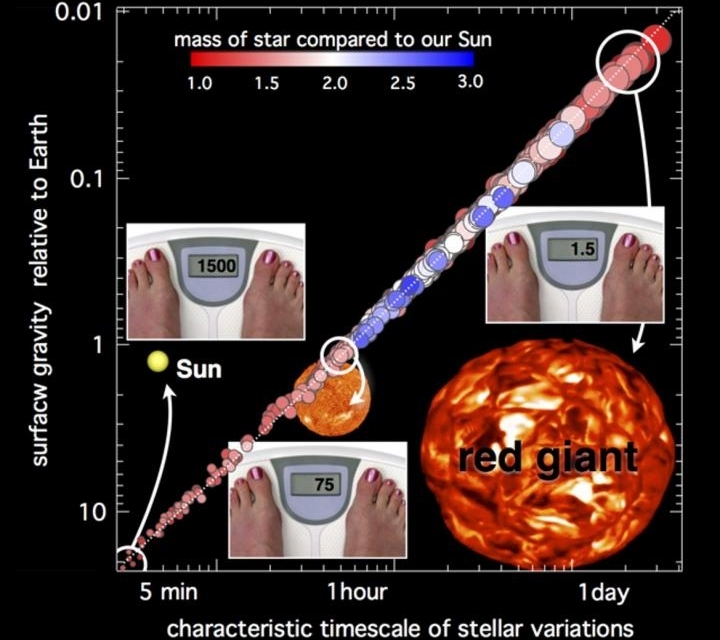 A red giant star (the far-future fate of our Sun) has a much weaker pull at its surface, so you’d be 50 times lighter. The new method allows scientists to measure surface gravity with an accuracy of about four per cent, for stars too distant and too faint to apply current techniques. Since surface gravity depends on the star’s mass and radius (just as your weight on Earth depends on its mass and radius), this technique will enable astronomers to better gauge the masses and sizes of distant stars. It will play an exciting role in the study of planets beyond the Solar System, many so distant that even the basic properties of the stars they orbit can’t be measured accurately. The new technique called the autocorrelation function timescale technique, or timescale technique for short, uses subtle variations in the brightness of distant stars recorded by satellites like Canada’s MOST and NASA’s Kepler missions. Future space satellites will hunt for planets in the ‘Goldilocks Zones’ of their stars. Not too hot, not too cold, but just right for liquid water oceans and maybe life. Future exoplanet surveys will need the best possible information about the stars they search, if they’re to correctly characterize any planets they find. “The timescale technique is a simple but powerful tool that can be applied to the data from these searches to help understand the nature of stars like our Sun and to help find other planets like our Earth,” said Kallinger, the study’s lead author.